The patron saint of our parish and school is Saint Gregory the Great. Gregory was born in Rome in 540 AD, the son of Silvia and Gordianus, a wealthy and influential senator. From the days of his childhood, Gregory was a pious and prayerful boy. Because of his family background, he received an excellent education, and was appointed Chief Magistrate of Rome by the Emperor Justin the Younger when he was only 34 years old. Gregory soon left the life of politics behind him, and embraced religious life as a monk. He founded seven monasteries in Sicily and Rome, including his own home – which became the Benedictine Monastery of St. Andrew. In 574, Pope Pelagius II ordained Gregory as one of the seven deacons of Rome, and later sent him as papal ambassador to the Byzantine Court of the Emperor Tiberius. Upon his return to Rome, Gregory happily returned to the cloistered life he loved, but continued to serve the Pope as his chief advisor. He was held in very high regard by the citizens of Rome. When he was 50 years old, Gregory was selected Pope by the priests and people of Rome upon the death of Pope Pelagius II. This was not an honor he wished for himself, but his 14-year papacy was marked by great energy and constant activity. Gregory’s industry is especially remarkable because he was in poor health – suffering from frequent indigestion, fevers – and later, very painful gout. Pope Gregory initiated a number of changes in the Liturgy, and is credited with the introduction of plainsong, which is even now referred to as “Gregorian chant.” He strove to meet the physical needs of both the many poor citizens of Rome and the wandering beggars who flocked to Rome from outside. He was an extremely capable financial manager of the Church’s great land holdings, and he strictly enforced the laws of the Church when he thought they were being violated. Gregory extended the spiritual power of the Papacy to many other lands, but also consolidated the political power of the Papacy as well. It has been said that it was through the efforts of Pope Gregory that Rome truly became the capital and center of the entire Christian world. Pope Gregory died on March 12, 604, and was immediately canonized a saint. 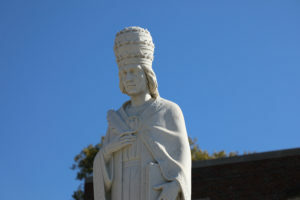 He was later given the title “Doctor of the Church” and has been hailed throughout history as Pope St. Gregory the Great – as a lasting tribute to all of his varied accomplishments.